Statistics Canada announced this morning that employment was virtually unchanged in April (down 1,100) following a surge in March and the unemployment rate remained at 5.8%–its lowest level in four decades. Wages growth accelerated signalling tight labour markets. April’s stall was only the second time since mid-2016 that the job market did not grow. When labour markets approach full capacity, job growth stalls as job vacancies become increasingly more difficult to fill. This excess demand for labour pushes up wage rates to lure qualified workers from other jobs. This trend poses a substantial challenge for the Bank of Canada as inflation is now at or above its 2% target. Economic activity has slowed this year, and considerable uncertainty remains, especially concerning NAFTA. In the face of a meaningful slowdown in housing and consumer spending, the Bank is reticent to hike interest rates too quickly as mortgage rates are already rising. The posted five-year fixed mortgage rate rose to 5.34% this week, as banks have tightened credit conditions and five-year bond yields have edged upward. Borrowers must qualify for mortgages based on the posted mortgage rate, and one-in-three borrowers have purportedly already been squeezed out of the housing market. Apropos the housing slowdown, employment declines were most significant in the construction industry, which suffered an 18,900 job loss offsetting the gains in March. Services-related employment was up 14,800 in April. Since the start of the year, Canada’s labour force has shrunk by 25,500, and the number of jobs is down by 41,400. The average hourly wage in April was C$27.02, up 3.6% from a year earlier. That’s the fastest pace of growth since 2012. In April, 4,100 more people worked in Manitoba, all in full-time employment. The unemployment rate was virtually unchanged at 6.1%. Compared with April 2017, the number of employed people in the province increased by 5,900 (+0.9%). In Nova Scotia, employment increased by 2,700 in April. The unemployment rate continued on a downward trend, falling by 0.7 percentage points to 6.7%, the lowest rate since comparable data became available in 1976. On a year-over-year basis, employment was up 8,000 (+1.8%), primarily due to a strong upward trend in full-time employment that began in the autumn of 2017. There were 4,900 fewer employed people in Saskatchewan in April, and the unemployment rate rose 0.5 percentage points to 6.3%. 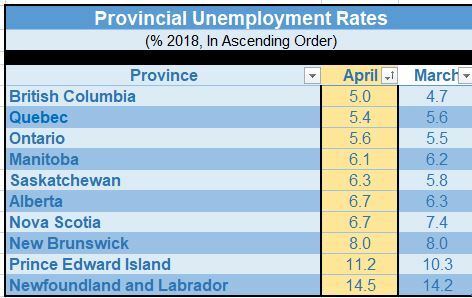 Compared with April 2017, employment was little changed in the province. In Ontario, employment held steady in April, and the unemployment rate was little changed at 5.6%. On a year-over-year basis, employment in the province rose by 133,000 or 1.9%, all in full-time work. In Quebec, both employment and the unemployment rate were little changed in April. Compared with 12 months earlier, the number of people working in the province was up 73,000, mainly as a result of growth in the second and fourth quarters of 2017. Over the same period, the unemployment rate declined by 1.0 percentage points to 5.4%. The number of people working in British Columbia was little changed in April, as growth in full-time work was offset by a decline in part-time employment. At the same time, the unemployment rate increased by 0.3 percentage points to 5.0% as more people looked for work. Employment in the province has been relatively flat since June 2017, while on a year-over-year basis it was up 23,000 (+0.9%).